Front of the recipe card for David’s Fruit Pie. 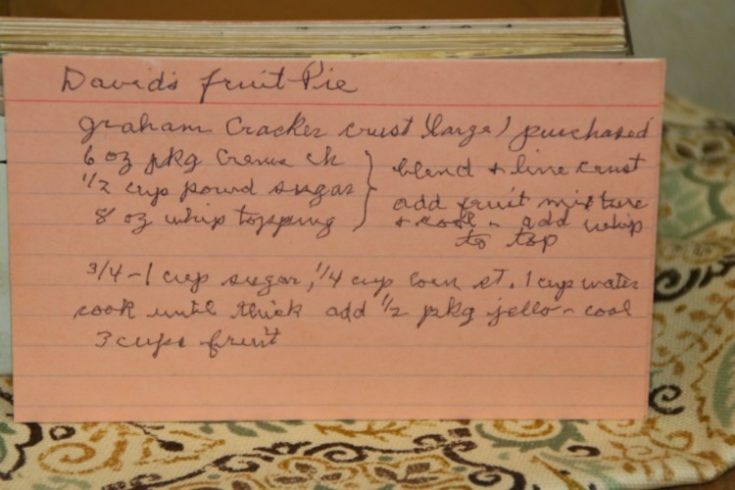 There are lots of fun recipes to read in the box this recipe for David’s Fruit Pie was with. Use the links below to view other recipes similar to this David’s Fruit Pie recipe. 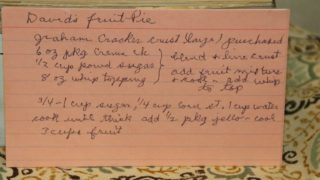 If you make this David’s Fruit Pie recipe, please share your photos and comments below! 6 oz pkg creme ck, ½ cup powdered sugar, 8 oz whip topping - blend & line crust. Add fruit mixture & roll. ¾-1 cup sugar, ¼ cup [corn sT], 1 cup water - cook until thick. Add ½ pkg jello and cool. 3 cups fruit.